Ben and Marina introduce the Past Perfect tense, and talk about a terrible event in Valencia. See notesinspanish.com to pick up the accompanying worksheet. Today we look at timetables in Spain and the UK, and more cool Spanish phrases as usual! See NotesinSpanish.com to pick up the accompanying transcript/worksheet, and to sign up for our free newsletter and report. We look at useful vocab and phrases for shopping and money, and have a real Spanish conversation on changing shopping habits in Spain. See NotesinSpanish.com to pick up the accompanying transcript/worksheet. It's Para time! In the last episode we tackled Por, and this time we cover its partner in crime, Para. See NotesinSpanish.com to pick up the accompanying transcript/worksheet with a complete list of all the uses of Para. It's Por and Para time! In this episode we start with a complete rundown of Por. See NotesinSpanish.com to pick up the accompanying transcript/worksheet, including all of the key grammar notes for Por. Lots of Spanish vocab and phrases for music today, and an insight into Marina's music tastes in days gone by! See NotesinSpanish.com to pick up the accompanying transcript/worksheet. Ben and Marina look at words and phrases connected with eating, ordering, and dealing with waiters in Spanish bars and restaruants, plus a rundown of the best Spanish tapas. See notesinspanish.com to comment and pick up the accompanying worksheet. It's time to tackle Ser and Estar! Plus some extra listening practice for the Past Tenses. See NotesinSpanish.com to pick up the accompanying transcript/worksheet. More great conversation starters and useful phrases, with a touch of football for making friends with blokes! See NotesinSpanish.com to pick up the accompanying transcript/worksheet. We look at great conversation openers in Spanish to help you out at parties, when you meet new poeple, with intercambios and more. See NotesinSpanish.com to pick up the accompanying transcript/worksheet. This week we discuss Amazon's Kindle, a revolutionary device that could change the way we read. See NotesinSpanish.com to pick up the accompanying transcript/worksheet. This week we look at how two key past tenses, the Preterito Imperfecto and the Preterito Indefinido, can be used together to tell a great story. See notesinspanish.com for the accompanying worksheet. Nada, nadie, ninguno... this week we explore the Spanish negatives! See notesinspanish.com for the accompanying worksheets. We look at which past tense to use to talk about things we used to do in the past. See notesinspanish.com to pick up the accompanying worksheet. Happy Christmas! A special show full of Christmas vocab, and details of Christmas in Spain. See notesinspanish.com for the accompanying worksheet. When was the last time you...? We look at how the Preterito Indefinido past tense is used to talk about things that happened in the past. 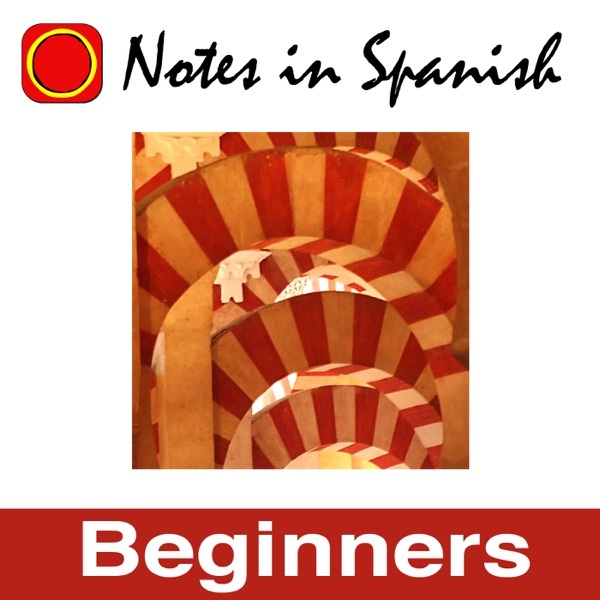 See notesinspanish.com for more details and the accompanying worksheet (includes transcript and translation of the Spanish section and full grammar and vocab notes). How to arrange to meet someone, and how to make excuses to get out of meeting someone! See notesinspanish.com for more details! This week we look at the future tense in Spanish, and talk about our vision of the world in the future. See notesinspanish.com to pick up the accompanying worksheet. In this episode we look at ways of giving advice in Spanish. See notesinspanish.com for full details and to pick up the worksheet. Ben and Marina look at how the perfect tense is used to talk about experiences we have had in our lifetimes. See notesinspanish.com for more details and the accompanying worksheet.